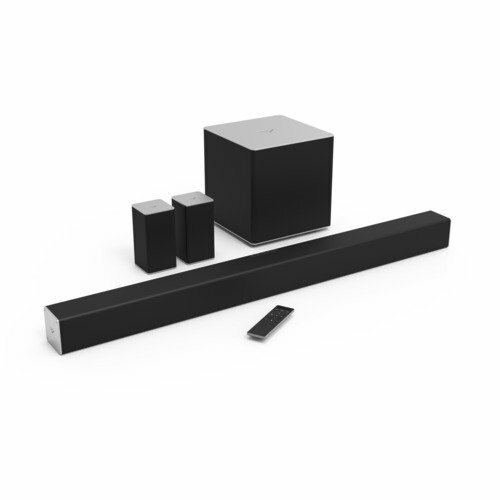 Enjoy the ultimate home theater experience with VIZIO’s 40″ 5.1 Sound Bar System. The sound bar is sophistically engineered, featuring a premium all-metal construction, delivering incredible audio for any 47″+ Class TV. In combination with the 6″ subwoofer and rear satellite speakers, the system creates a true 5.1 surround sound experience. With an added HDMI cable, you have access to the best possible audio quality for your TV. Built-in Bluetooth with aptX technology allows you to wirelessly stream audio from your smartphone, tablet, or computer in near-CD quality, and an intuitive LCD display remote is included to bring all of the controls and settings to the palm of your hand.